When the weather warms up it is time to stray away from soups and other hot foods. Today, I am sharing some summer meal ideas that I am sure you will love. As an added bonus, I have also shared two places where I find summer meal ideas when I am short for time. This recipe is perfect to make for a family meal. It is easy to make and only takes ten minutes to prep and twenty-five minutes to cook. The entire family will love it and you can find the full recipe here. Do you frequently eat salads at home? Why not consider putting a spin on the traditional Caesar salad. This dish can serve ten people and you can find the full recipe here. If you are a smoothie lover, you have to check out one of the smoothie recipes that I created. It is delicious, includes fresh fruit, and it is easy to make. Children and adults can enjoy a smoothie in the morning or after a long day out in the sun. Breakfast is the most important meal of the day. With your crockpot, you can make a breakfast casserole that gives everyone the energy that they need to make it through the day. You can find the full recipe here. During the school year you may find cooking dinner every night tiring. However, during the summer you have to make sure that your kid eats breakfast, lunch, and dinner every day of the week. Meal planning is essential during the summer months as it makes things less stressful for you as you continue to keep up with your work schedule. If your kids are old enough to cook unsupervised you can give them the duty of fixing meals during the weekdays and you cook your recipes on the weekends. Pinterest – When you want to find simple and easy recipes for the summer go to Pinterest. You are bound to find something your family will like and something that is easy for you to make. Super Cook – Super Cook allows you to type in your ingredients available and browse through recipes that only use the ingredients that you have available. What are your go to summer meals? If you have your own recipe for a great dish feel free to share it with me. 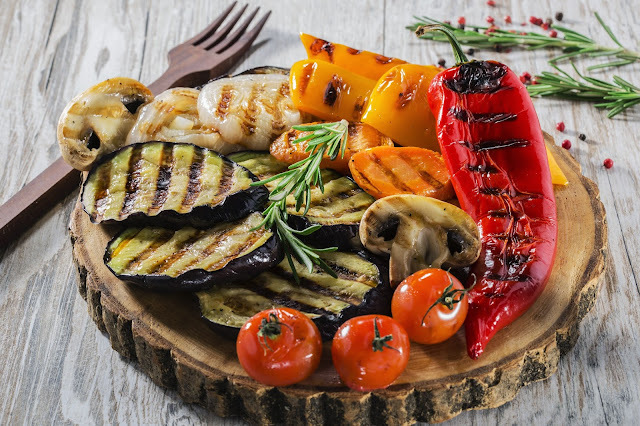 Oh my those grilled veggies look amazing! I know right! I love me some grilled vegetables!